This recording was made in February 1999 and published for the first time in the May 1999 issue of BBC Music Magazine. Copies published in the United Kingdom included the entire opera plus six overtures: Pinafore, Pirates, Iolanthe, Mikado, Yeomen, Di Ballo and Macbeth. Copies published for export included a single disc of highlights. A commercial issue appeared in 2005 on the German CPO label. Nearly everyone who has heard the CD is gushing with praise. 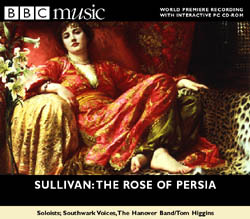 Stephen Turnbull, for example, wrote that it is "an outstanding performance [that] demonstrates just what a good work The Rose of Persia is." 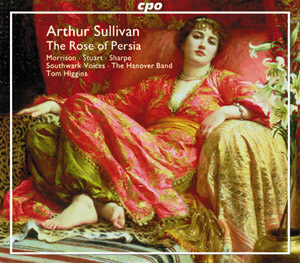 With all the talk of the wonderful new recording of The Rose of Persia the second CD containing the Overtures is a little bit overlooked. I am not sure, but I suspect that some of the overtures themselves were recorded at different sessions. The result is that while they are all very fine recordings, and one or two absolutely sparkle. The great bass drum notes at the beginning of the Mikado sound like the Devil pounding on the gates of Hades! This is a great test for the speakers but set the moment for what, I think, is probably the best ever recording of this overture. The recording brings out parts of the orchestration which I have never heard before. The performance is alive and rips along at a lively pace. The Hanover Band sound like they are really enjoying playing the work. Pinafore and Yeomen also stand out which makes this collection, in my opinion, probably the best collection of overtures currently available. This is the first time that a full-length Sullivan opera with a libretto by someone other than Gilbert has received a complete professional recording. (I consider the other recordings these operas have received to be amateur or semi-pro.) Correspondent David Trainer also observed that it's "the first and only Sullivan recording using 'period instruments' (horns crooked in various keys as required, and the beautiful 'cornet-a-piston')." Let us hope that it is a harbinger of greater things to come.